PT Tugu Pratama Indonesia - TPI or referred to as "Asuransi Tugu" is a reputable financial services company with strong business focus on insurance industry. Asuransi Tugu has business competencies on loss insurance services related to oil and gas industry as well as marine hull. Asuransi Tugu also offers a full range of insurance products; health insurance, credit insurance, aviation insurance, credit insurance, fire insurance, transportation and salvage insurance. PT Tugu Pratama Indonesia is a non oil and gas subsidiary company of PT Pertamina (Persero), the national oil company of Indonesia. At present, PT Tugu Pratama Indonesia is 65% owned by PT Pertamina (Persero), 17.6% by PT Sakti Laksana Prima, 12.15% by Siti Taskiyah and 5.25% remaining shares by Mohamad Satya Permadi. 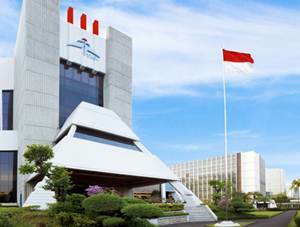 Headquartered in Jakarta, Asuransi Tugu offers services through 6 domestic branch offices and was supported by 281 employees (as of December 2016). Its domestic branch offices located at Surabaya, Bandung, Medan, Balikpapan, Semarang and Palembang. Asuransi Tugu also supported by 1 overseas office at Hongkong. In the full year of 2016, Asuransi Tugu generally recorded a good performance. According to PT Tugu Pratama Indonesia Consolidated Financial Statements 2016 as cited by JobsCDC.com, Asuransi Tugu reported total assets of USD943.44 in the full year of 2016. This number is up 24.50% from USD757.73 million in the full year of 2015. In 2016, the financial performance of Asuransi Tugu recorded its total revenue atUSD134.07 million, and total income at USD68.80 million. These income figures showed an increase of 53.50% and 356.23% respectively. Asuransi Tugu booked total revenue of USD87.34 million and total income of USD15.08 million in 2015. Still registered as an active student of Undergraduate Program/S1, majoring in Visual Communication Design (DKV) / Public Relations / Advertising & Marketing Communication / Mass Communication (Preferably for students in 5th or 7th semesters and free courses). Have a high interest and skill in creating creative writing (bilingual language). Familiar with Adobe Illustrator and Adobe Photoshop. Willing to follow Internship Program for 3 months (February-May 2018). Willing to attend the Internship Program in full every Monday-Friday. Hold Associate Degree (D3) in various Departments. Open to new graduates or have a working experience of up to 2 years. Interested in carrying out administrative tasks. Have high accuracy and good time management to complete the task in accordance with the deadline set. Willing to work with contract system for 6 months. Familiar with Microsoft Office, especially Microsoft Excel. JobsCDC.com now available on android device. Download now on Google Play here. Please be aware of recruitment fraud. The entire stage of this selection process is free of charge. PT Tugu Pratama Indonesia - Fresh Graduate Admin, Internship Pertamina Group January 2018 will never ask for fees or upfront payments for any purposes during the recruitment process such as transportation and accommodation.